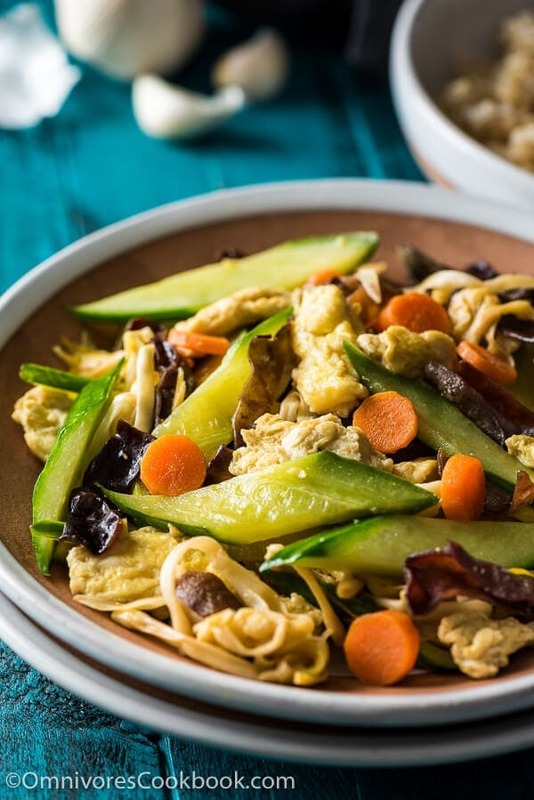 Moo Shu Vegetables is a quick and delicious dish that you can serve as a side or enjoy as a main. 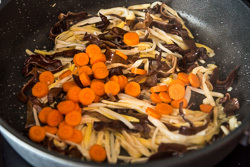 Learn how to use wood ear mushrooms and lily flowers to add flavor and texture to your veggie dish like a real Chinese chef. Moo Shu Vegetables is one of the dishes I’ve missed often after moving to the US. It is a dish my mom would always cook for dinner when we were running out of veggies and meat in the kitchen. 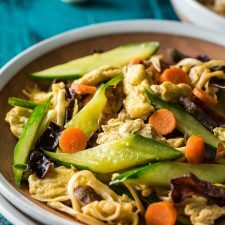 It looks so plain and simple, yet it cleverly uses dry goods – lily flowers and wood ear mushrooms – to add great flavor and texture and make a plain stir-fry dish delicious and fulfilling. Although it’s usually served as a side dish, it can be served as a main for a light lunch or dinner over steamed rice. 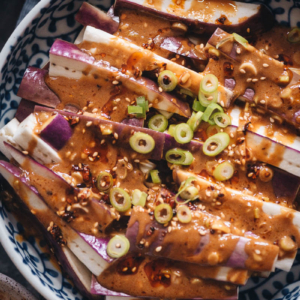 This is a family recipe that might look very different from the American Chinese moo shu vegetables. First of all, we do not serve this dish with pancakes. Second, it does not require hoisin sauce. For my family, this is the type of dish that we’d eat on a daily basis with a bowl of steamed rice. 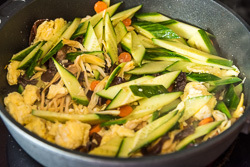 The standard ingredients include lily flower, wood ear mushrooms, cucumber, and egg. I added carrot to the dish for extra color. Some families also prefer to use bell pepper to add texture. Family style moo shu vegetables require very basic seasoning. You just need some soy sauce, a bit of sugar, and some salt. That’s it. The key ingredient is lily flowers. 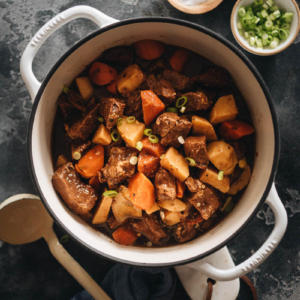 It has a very special flavor that makes the dish stand out without adding any heavy spices. 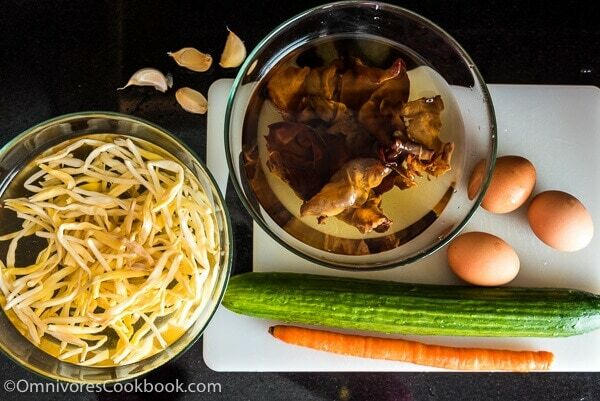 Of course, if you have homemade chicken stock, definitely use it in this dish to enhance the flavor. 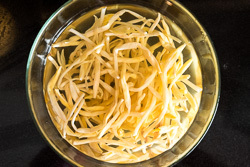 My mom sometimes uses the lily flowers’ rehydrating water as a vegetable stock, and adds it into the stir-fry to add a bit of moisture and to enhance the flavor. Try this dish once and you’ll be surprised that you can create such a satisfying dish with such minimalist ingredients. Do you like my recipes? 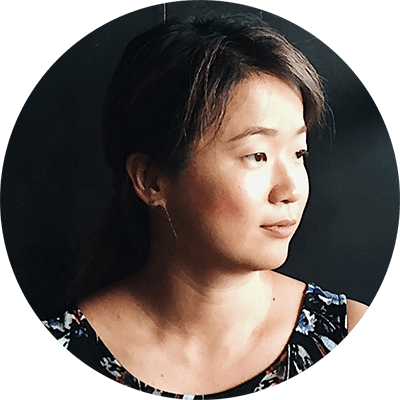 Sign up for Omnivore’s Cookbook’s weekly newsletter to get the latest updates delivered to your inbox, plus a free e-cookbook! And stay connected via Facebook, Instagram, Pinterest and Google+. Thanks for reading, and happy cooking! In a large bowl, add lily flowers and hot water to cover. Let rehydrate for at least 1 hour. When the lily flowers turn very tender, gently rinse off the sediment in the rehydrating water and drain. Snip off the tough ends. Halve them if too long. Do not squeeze the rehydrated lily flowers (*See footnote 3). In another large bowl, add wood ears and hot water to fill up the bowl (*See footnote 4). Let rehydrate for at least 1 hour. When the mushrooms turn very tender, rinse a few times and drain. Remove and discard the tough parts. Slice into small pieces. Heat 1 tablespoon oil over medium high heat in a large nonstick skillet until warm. Add egg. 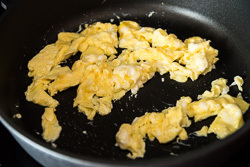 Cook and stir like you would when making scrambled eggs. 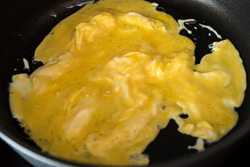 Transfer to a bowl immediately after the egg is cooked. Add the remaining 2 tablespoons oil and garlic into the same skillet. Stir a few times until fragrant. Add lily flowers and wood ear mushrooms. Cook and stir for 1 minute. Add carrot. Cook and stir until the carrot turns tender, about 1 minute. Add cucumber. Swirl in soy sauce and sugar. Immediately stir to mix well. Return cooked egg to the skillet. Season with sea salt. Continue stirring until all the ingredients are mixed well. Turn to low heat and taste the vegetables. Add more salt if necessary. Stop heat. Swirl in the sesame oil and stir to mix well. This dish requires a relatively large amount of oil. If you skimp on the oil, the dish will turn out very dry. English cucumber has a crisper texture and a very thin rind that does not require removal. 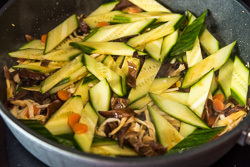 It works better in stir fried dishes than the short or the dark varieties of cucumber. The lily flowers will requires some time to cook and the water inside will keep them from turning too dry. 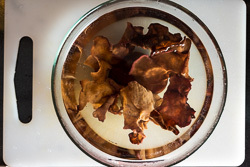 The wood ear mushrooms will absorb water and turn a few times larger than they were when dried. If you don’t add enough water to the bowl, some parts of the mushroom won’t be submerged well and will remain very tough after soaking. The homemade chicken stock is very thick and flavorful, so you can add a small amount to enhance the flavor without making the dish watery. Do not use store bought clear chicken stock. It won’t add much flavor in this case. That sounds so good! I love the dried lily flowers! You know the more I cook, the more I realize that there are so many dishes I haven’t cooked, lol. I love your creations, Maggie, and this is a dish I could eat on a weekly basis. I’ve got to get my hands on those mushrooms and hmmm…lily flowers, too. I’m sure I can find them in Chinatown in Toronto. I just have to find the time to go because once I’m there, I never want to leave. It’s one of the biggest and best in North America. 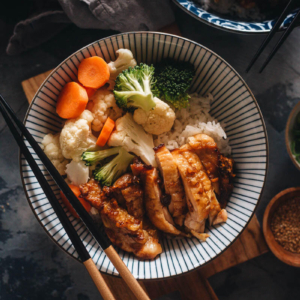 You’ll find Thai, Japanese and Vietnamese restaurants interspersed with the traditional Chinese, making the area a great source for a wide variety of authentic Asian cuisine. Time to visit! Thanks for another fabulous dish! I share the same feeling and I just felt it again today, when trying out a new recipe! So many nice recipes yet so little time! 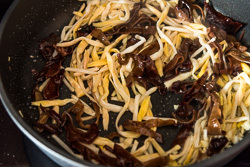 The wood ear mushrooms have a very special texture, and so far I only used it to cook Chinese food. I’m looking forward to seeing how you will cook with them. 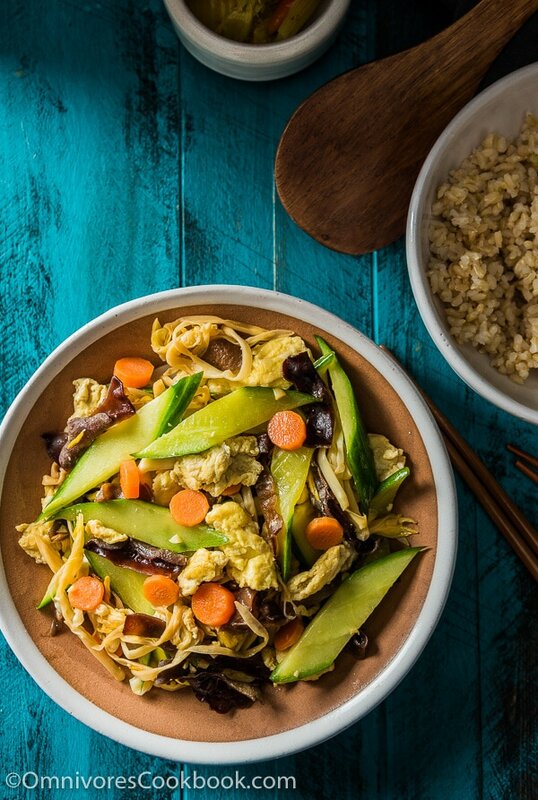 Maggie, you have simply outdone yourself with this Moo Shu veggie recipe and your new eCookbook! 5 Star+. And the presentation is beyond anything I’ve seen on the web or in bookstores. Your photography and page formatting has reached hew highs! I want to cook all 30 of your recipes starting this week. Happy cooking and let me know how the dishes turn out! Thank you for sharing your wonderful recipes!!!!! Maggie, I know I can buy dried lily flowers but we grow day lilies in our yard. They are the same lilies you see growing wild along the highways. I would like to use the fresh lilies in the recipe. But I would also like to freeze the blossoms for future use. They only bloom for one day (*day* lilies ) so I would pick them at the end of the day put them in a small plastic bag and freeze. How many fresh or frozen blossoms would you use in the recipe? Or should I dry the blossoms rather than freeze fresh? Hi Eva, wow, it’s very impressive that you can get those fresh! To speak of using the fresh buds, you want to be cautious. 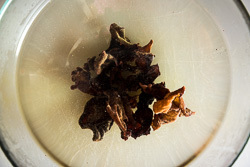 The buds contain toxin and you want to remove them before cooking. 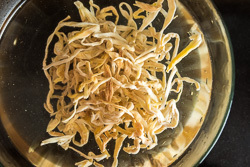 To use the fresh lily buds, remove the stamens and and filament, and soak them in salted water for 30 minutes (dissolve a small spoonful of salt in the water) before using. Or you could briefly blanch the lily buds and discard the water. These are difficult to measure. I think you can try 1 cup loosely packed lily buds in this recipe. I never handled fresh lily flowers, but in Chinese cooking we prefer to dry them. The drying process will get rid of the toxin and their texture will be good after rehydration. I doubt they freeze well due to the high moisture content.